Didn’t school just get out? How is it time for new backpacks, new shoes, new notebooks and pencils already?! 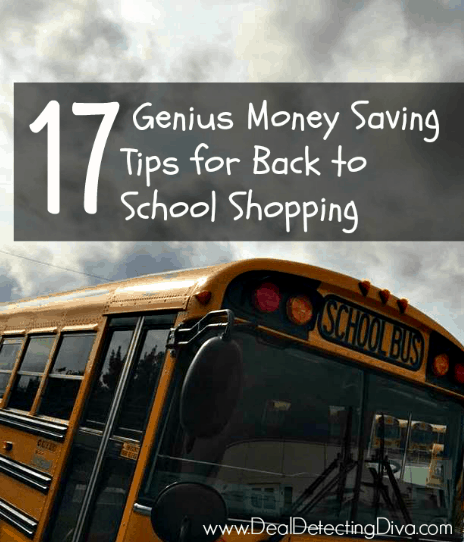 Back to school shopping is no fun, and if you’re not careful it will break the bank as well. Now I’m scrounging through the drawers looking for partially used erasers I can send to school instead of buying new. 1. Talk to your kids about their expectations. Your children have expectations and desires on what they want this year. Lay down the law before you head to the store to pick out backpacks, clothing etc. My 9 year old threw a fit last year because he wanted the $4 folders, when the 97¢ ones are the same. exact. thing. Needless to say, he got the 97¢ folders, but in the colors of his choosing. It’s okay to have a “wish list” but it may end up being just that, a wish list. 2. Shop around. Try not to buy all of your school supplies at once. Or even in the same week. Why? Because unless you literally have no time to spare, you’ll always do better buying just the best deals from each week – even if you shop the same store over and over again, from week to week with their sales. 3. Reuse what you can. Sure, your kids will want a new backpack. I did too when I was a kid! But, I didn’t always get one and believe it or not, I survived. As long as that puppy is in good condition I see no need to buy a new one. Hey, it already has their name on it too! Bonus. 4. Start shopping early. As soon as your school releases their back to school shopping list, jump on it. You should be able to find a list on your school’s website. Start looking for deals in the weekly circulars and watch for sales. In fact, never stop shopping for school supplies. Watch for clearance deals all year long that you know you’ll need in August. Clearance is your best friend. 5. Use and abuse those doorbusters. Doorbuster sales are just that: doorbusters. Go in for the 1¢ items, or the super cheap crayons, markers, folders etc, but don’t be afraid to buy only the bare minimum. This is just another reason to start early and watch the sales. 6. Know when enough is enough. So the teacher requested Kleenex brand tissues, huh? Well I’ve got Puffs and I’m not afraid to throw it in the backpack. Tissues are tissues folks, and I’m going with either a.) what’s in my stockpile or b.) the best deal at the store. 7. Invest in the backpack. We’ve all seen it, Walgreens, Target, CVS or Walmart will advertise $2.99 – $4.99 backpacks for one or two weeks a year. While these can be great for preschool or pre-k, they may not be your best option for older kids. Even in grade school, our kids are hard on their backpacks. If it really is time for Johnny to get a new backpack, invest in a higher quality backpack that will last and last. Have a Jansport? Take advantage of their lifetime warranty! 8. Shop all year long. We always shop big for our kids’ clothing. What is on clearance this spring (in a size too large) will work splendidly this fall! Same principal for shoes. If you find a great deal on shoes that your little one just loves, maybe go ahead and buy a bigger size up. You know he/she likes them, why not go ahead and get a larger pair? Those new kicks you buy in August will be worn out or outgrown by Christmas. 9. Go through their closets/dressers before clothing shopping. Our oldest son is super tall. Like 98th percentile tall. Our younger son is a shorty. Like 9th percentile. Just a few weeks ago I went through and found about six pairs of jeans that our older son Caden outgrew in a blink during a growth spurt. 10. Sell what you can. After you go through their clothing, sell what no longer fits and is in good/decent condition on a virtual yardsale group or Craigslist. Use those funds to buy their new clothes for the coming year. 11. Don’t buy all of the clothing at once. After going through the kids’ clothing, buy only what you absolutely need to get by for the first few months. Don’t buy the entire wardrobe until they start clearancing out fall clothing. 12. Host a clothing swap. Have friends with kids of opposite ages? Host a clothing swap! Consider inviting 10-15 of your friends and have them each bring an agreed upon number of clothing items. Swap it out and walk away with new-to-your-kids clothes (and a girl’s night). 13. Buy electronics late August – early September. Need a new laptop? The end of August through early September is historically the best time to buy electronics. In general, remember this on Labor Day. 14. Use our search tool. Head over to this page and enter what you’re looking for. When the back to school sales are in full swing, you can use the search term “pencil” and it will show you everywhere pencils are on sale, for how much and if there are any applicable coupons to use on top. See our search tool on THIS PAGE. It works for food and health & beauty and home as well! 15. Keep your receipts. Just in case you do overbuy, make sure to keep all of your receipts. If they don’t use that $6 binder, return it! No shame in my back to school shopping game. 16. Price match. Is that bangin’ deal at Office Depot sold out? Price match at Walmart or Target! Keep up on your current price match policies, and you may take the ad with you for backup. 75¢ here and 50¢ there adds up when you’re doing it on multiple items. 17. Leave the kids at home. If possible, do your back to school shopping without the kids. Pencils are pencils, markers are markers, folders are folders. Now, I will let my kids pick out their new backpacks (within reason) and their pencil boxes (assuming they get the cheap ones, lol) but I find that doing the majority of the shopping without them in tow makes a huge difference on my spending. Not to mention my sanity. Do you have master "Best Price" list for schools supplies? I.E. crayons are .50 now, but you usually can get them for .25 on sale; so we would know what best price to look for. Thanks for all you do!